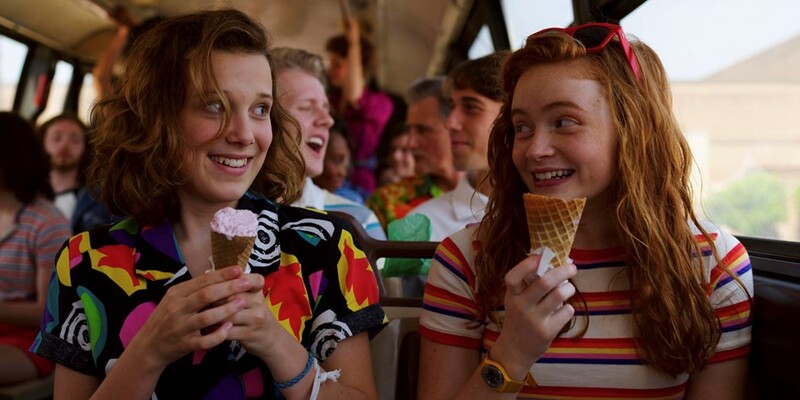 The first trailer for the third season of Stranger Things is here, and while the gang are growing up and enjoying summer, there’s still the threat of an otherworldly Big Bad. The teaser, soundtracked by The Who’s “Baba O’Riley”, features most of the major cast – Eleven (Millie Bobby Brown), Mike, Max (Sadie Sink), Will (Noah Schnapp), Lucas (Caleb McLaughlin) all stage a surprise party for Dustin (Gaten Matarazzo). We also see Jim Hopper (David Harbour) continually working to make Hawkins safer, Nancy (Natalia Dyer) and Jonathan (Charlie Heaton) looking grave, a lifeguarding Billy (Dacre Montgomery) Joyce (Winona Ryder) looking a bit worried but with a new haircut, and everyone’s fave Steve Harrington (Joe Keery) having a good time. Summer looks fun, with the edition of a new Hawkins mall and the county fair. Whereas the last series centred on Halloween-time, this season is set in 1985, in the run-up to July 4 celebrations. But of course, Hawkins is still the epicentre of interdimensional portals and terrifying creatures – we get a glimpse at a particularly big and slimey one. Watch the trailer below. Stranger Things 3 is set to launch all of its episodes July 4 2019.